Note Songs: Tea Party Hosted by Jan!! Welcome to a day of Tea Parties hosted by Jan at www.jt-jantom.blogspot.com/ . Go on over to her blog when you're finished here and you can visit everyone taking part in this wonderful event today! I'm so thrilled you're here to have tea with me today. It's a little special for me because I'm using some old Fostoria crystal that was passed down to me from my Aunt Alma after she passed away. Even when I was a very young girl she would tell me she wanted me to have her crystal. I was having tea parties way back then and she knew I would love and cherish her pieces. I do! So come into the living room and sit down. I've dressed the table up just for you! I have a pretty old tablecloth here (I even ironed it) and everything is in place for our tea! C See the pretty Colony crystal plates? I think they're just so dainty. Let me pour the tea. Oh, good! It's just perfect, not too strong, just right! Aren't the cup and saucer sweet, too? What do you take in your tea? Some cream? Again, look at the Colony sugar and creamer. I like to float a little slice of lemon on top of my tea. Doesn't it smell divine? You know you just cannot have a proper tea without serving cucumber sandwiches. Would you like one? I just made them this morning. Do you like the sandwich server? I don't get to use it enough. Here are some fresh blackberries in a perfect little bowl - Fostoria American pattern. Biscuits dipped in chocolate (that's what the English call cookies) in a three footed Colony crystal dish. I've even bought six long stemmed roses for this occasion and put them into a lovely crystal vase my Mr. Precious gave me. This vase is soooooooo heavy. Can you smell the fragrance? Hmmm, I love the smell of roses. Aw, and a little candlelight is always a good thing. Again, I'm using the little American patterned footed compotes for my candle holders. Are you tired of tea partying? I hope not. I thought we would continue in the dining room using my special found treasures. My beautiful Blogland tea pot is all dressed up with baby's breath and a tassel made by Susie Harris at www.susieharris.blogspot.com/ Susie makes these awesome tassels and you must go visit her. My teapot is sitting on a very old doily crocheted by my Grandmother. I love to use old things along with my new ones. I am very grateful to have a few things from my Grandmother. I showed you this beautiful pitcher that goes with my Blogland tea pot yesterday. While you where answering your cell phone, I quickly cut the stems of the roses so they would fit in the pitcher. I think they look so pretty, don't you? Wish I had a rose bush of my own. I don't think I can grow rose bushes very well. I made too many sandwiches and scones ~ but since this is such a nice occasion, let's go ahead and eat a little more. See my silver? Back when I lived in Alabama as a little girl - well, I never was a little boy! - my uncle worked in a silverware factory. He gave me a set of silver when I was about nine years old. This is the silver and I'm now 56! I have always thought it was so beautiful! We're drinking the Apricot Peach tea that I won in Jan's giveaway a few weeks back. It tastes divine, doesn't it? I need to stir my tea just a tiny bit more to dissolve the sugar. I seem to be really all about old things today. My tea things are sitting on a little tea cloth that was made by my Grandmother. She was so good at needlework. She embroidered this and crocheted the sweet little pink edging all around. She went to be with Jesus when she was ninety one years old! The fabric is very thin and there are a few little stains on the cloth, but I cherish it. I'm so glad you've come to my tea party. I have enjoyed it so much! ...enjoy the pretty roses I didn't grow in the pitcher I am beginning to love that will sit on my kitchen window sill. Oh, Shelia...What a beautiful table you set!! I see some of that "JOY" there!! LOL!! mmmm, mmmm...everything tastes delicious!! Sheila, you shouldn't have gone to so much trouble for us, but it certainly was lovely! I especially love the Fostoria. Thank you for the heavenly tea, I must have you over to my house for a cuppa real soon. Everything was so elegant and beautiful, I loved the cucumber sandwiches and scones but I especially cherished looking at your Grandmother's needlework. WHAT? NO COMMENT on the BATHROOM BEAUTY SNAPPERS plug I gave you? You are going to stick around to take everyone's pix, aren't you? Have another piece of cake, another scone...another cup of tea? Oh what a lovely tea party you held for us. 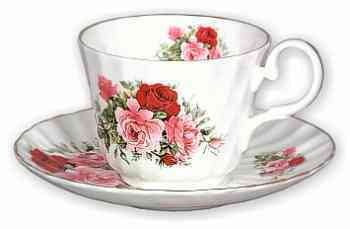 I loved using the beautiful tea cups and the sandwiches....just yummy. Thank you so much for going to all that trouble and using your finest beauties on the party. Just delightful!!! Absolutely lovely, Shelia. I loved every detail, especially the family pieces and their stories. I think your uncle recognized the woman you'd become when he gave you the silverware at age nine. That just touches my heart. I never cared for Fostoria until a couple years ago. It always seemed outdated without being old enough to be special. LOL, I guess I'm the one who got old enough that now it is "just right" and I love setting my table with it. I thank you for the wonderful tea party today. The only way it could have been better would have been to share our tea in person. Thank you ever so much for the tea! Everything was just lovely! I just loved looking at all your beautiful treasures! It was such a nice break for me this very busy morning! You really did go all out! Every single thing is gorgeous. Food looks yummy. Just one thing, you didn't give directions how to get there.??? Shelia, a prettier table setting I've never seen! The roses are glorious, as is all your serve-ware. But you really went to all this trouble... brewing tea, making sandwiches and goodies, buying flowers, just for this blog post? AMAZING!!!!!!!!!!!! And dammit, you've made me hungry! You set a beautiful table Shelia! The serving pieces and accessories are gorgeous and the food you prepared looks scrumptious. I may have to make a few little cucumber sandwiches and have them with tea, today. I love cucumber sandwiches. You sure set a pretty table. I've always loved Fostoria and have a few pieces myself. Tell the truth Shelia, you and Mr. Precious ate all those goodies after you put the camera away! Thank you for hosting such a lovely tea party. I am so happy I was invited. Your china was beautiful, your choice of tea delicious and your little sandwiches and scones..oh my...you really went way out. Isn't it lovely to have family pieces like the embroidered pieces and your china. Such a nice way to begin the day. You set a very lovely table! Even though I am not a tea drinker every thing is just too pretty to turn down your offe to come to the party. The food looks divine!!! I really like the way you have displayed the candles. You are quite the hostess! Thank you so much for the wonderful tea...your table was beautiful and I just couldn't eat another bite of the fantastic food! I'll take my tea with milk, no sugar, please! Oh, Sheila, I really had a great time. This is an elaborate tea party and I so enjoyed looking at your entire collection of beautiful pieces. I'm so glad you inherited your Aunt Alma's pieces. What a treasure! And thanks for sharing! Hi Sheila, wow what a beautiful tea you are having here! I just love everything but especially the embroidery from you Grandmother. I wish I had some from mine, but I don't have a thing. My father's side of the family all did embroidery even the men. I don't know what happened to any of it. I tried to track some down but no luck. My Aunt told me that my grandmother made everyone one of the grandchildren a yoyo quilt, not one of them around either. I get a funny feeling inside everytime I see a yoyo so I must remember mine deep down inside! I have a few things my father made for me before he died and I will post them one of these days. I missed Miss Chloe Dawn today, didn't she come to tea? What lovely eye candy Sheila! Oh Miss Sheila.. You make me feel so special when I come to your house for tea. Sorry I didnt get to do the bathroom picture. With this sick one at home going to the grocery is a chore. I will get to it I promise... I must be brave, smiles... Thanks for the tea! hope you have a blessed weekend! Beautiful! I loved the way you did the cloche. Oh Pickle..I am sitting here with tears in my eyes..this is the most beautiful thing...those crystal pieces and that cloch you did oh and your grandmother's beautiful embroidery..oh girl I know you must treasure it all...I just am speechless..this not only delighted my eyes but it touched my heart...oh girl where's the hankie? Beautiful post dear soul...beautiful post! Shelia, your blogs is one of my favorites. Today's post is so beautiful and ambrosial, I could taste the delicious tea. And the details are inspirational. Yes, this is why I love to blog. I will prolly never buy another decorating magazine. Thank you for this incredible tea. Er, that should be blog, not blogs. Sheila...everything Looks Perfect!! I have some very pretty blue fostoria glasses that I just Love....you have a great selection of wonderful pieces to use...Oh I just love Tea Parties! I truly enjoyed your "Tea Party". The table was absolutely beautiful with all the treasures that have been given to you. I enjoy going to Tea Rooms with friends and yours was just as beautiful. Oh my goodness.. this is the best tea party for today.. so many yummylicious food.. love the blackberries, the cookies, the sandwiches.. ahhhh.. super!.. even tho' my tummy is full, I make some more room for your food.. hehehehehe.. thank you for sharing this wonderful party with us..have a nice weekend.. I'm a teatottler! Oh this was such a delightful Tea Party Shelia. Enjoyed your Tea Party. Thanks for suggesting I post about the blue and white dishes - I just love them. I changed my post to say thanks to you for suggesting them - don't know if you saw that or not. I enjoyed seeing all your prettiness... very lovely! Have a sweet weekend, Shelia! Sheila your tea party is stunning. The beautiful dishes, the pretty tables set so lovely, the table linens, and the goodies with the flowers too. How divine. I have a confession, I haven't had a minute to do the bathroom thing. Are you still doing it? I will be home Sunday night. No more grands or company for awhile. think of it, time for me and my dh. What a concept. Let me know. I think it is a hoot and a great idea for some fun. I heard you were having a tea party and I just decided to check it out. I'm so glad I did because this is utterly charming and delightful. Could you share how you made the cucumber sandwiches? I've never tried them before. I have one of Susie's lovely tassels. Mine is of the vintage sewing machine. Where on earth do you store all your wonderful china and dinnerware? You always amaze me with the things you have for dining! Oh Shelia! I have enjoyed your tea party so much! What a beautiful presentation you have made here! And thanks for letting us get seconds- the little sandwiches were so good but I didn't want to be rude and eat them all myself. (I did hide some in my purse to take home though!!) LOL!!! What beautiful treasures you have. Your glass collection and your linens are devine!! I love the one that your Grandmother made- how precious!! I have some hand embroirdered linens and doilies and I treasure them more than gold! Thanks for hosting this lovely event. Maybe someday we can have a real tea party together!! I love your Colonial glassware! And yes, you are very creative, using the compotes as candle holders and the beautiful cloche with the tiny roses in the drinking glass! I'll be on vacation all next week, getting you plenty of powder room pictures, I hope! Thank you for stopping by my tea party today! I don't know where to begin,everthing is so lovely. Love the swirls in your crystal ...like ripple waves near the calm shoreline. And those darly white tea pot and pitcher with the pink roses and blue flowers...just wonderful. Thank you for your kind comments on my blog! I noticed that you are a church pianist too! God bless you! Now I'm off to explore more of your wonderful blog! Fist I cut the crusts off the bread with a bread knife. To assemble each sandwich: Mix together first 4 ingredients and spread evenly on 2 slices of bread. Top with cucumbers, and remaining 2 slices of bread. Cut sandwiches into 2 triangles or rectangles. Or you can do this to garnish, place a dab of remaining spread on top of each triangle or rectangle and add a bit of chives. My dear Shelia; I want to thank you for a very sweet and lovely tea. I had such a wonderful time, and the food was very delish. The table setting was divine and lavishly done. You have such wonderful taste. Have a great weekend. Again thank you for a great time. I never tire of tea or parties. Oh, what a beautiful tea party!! I love the Colony dishes, very feminine and swirly. And the covered floral centerpiece - lovely! It looks absolutely lovely. It's probably a good think I wasn't there in person, because I like way too much sugar in my tea. I might embarrass myself. I am just getting to the tea party...so many parties...so little time. Thank you Sheila for sharing your recipe. Lovley display, I perticularly love the roses in the pichure! I have to say, when I see the wave effect in china I usualy dislike it, but in crystal it's just darling! What a wonderful history you have behind your pieces. Please stop by and see my tea table. What a creative and delightful post! All of your china and crystal pieces are fabulous! I would certainly love to be a guest at one of your parties! What a fun tea party we had! It was fun. And so elegant. Your things are just gorgeous. You are fortunate to have your aunt's beautiful Fostoria. I have some of my grandmother's American pieces. I treasure them because they were hers. And they bring back memories of big family gatherings for the holidays at Grandma's house. Thank you for hosting this party today and for inviting us to join you. It was lovely! Bee-yoo-tiful dishes! I have something very similar to your crystal that my grandmother handed down to me. I have it packed away, but should pull it out and take a look at it again! What a fabulous post! I really enjoyed reading your warm and witty text and looking at the lovely pictures. By the way I have a few pieces of the same silverware pattern your uncle gave you. I got them from my mother. Sheila..this is a fantasy come to life! Just viewing this post makes me feel so warm and cozy and happy. Almost like I was with you and enjoying the most perfect tea! I would even be sure to keep my pinkies up! What a beautiful table! Thanks so much for sharing. I hope you are able to get your home back in order soon! Hugs! Oh, my this is just beautiful. Nothing has been left out. Thanks for having me and this lovely visit.